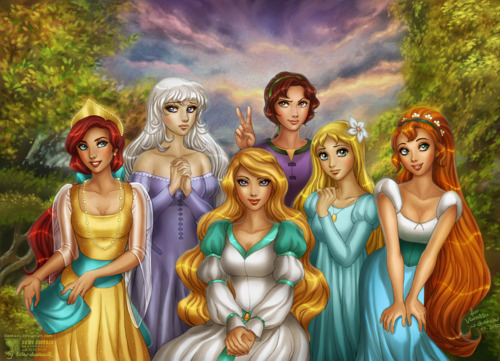 Non-Disney Princesses. . Wallpaper and background images in the Childhood Animated Movie Heroines club tagged: non swan princess odette anastasia heroines princess. And by the way, I love how Amalthea looks on this picture. i just don't know who's that blonde girl next to odette. is it marina from the little mermaid? I love this picture and it is killing me because I don't know who the one girl is. Who is the girl in blue with the flower in her hair and the gold necklace? Ah, Okay. I will have to find out more about her.